Altpick.com : Library : Fire Engine No. 9! Michael Austin's latest children's book hits the shelves next week! Fire Engine No. 9! Published by Random House. Starred reviews from Kirkus Reviews, The Horn Book and Booklist! Told almost entirely in sound words, this day-in-the-life look at firefighters and their fire truck will appeal to the youngest vehicle enthusiasts and to parents with a penchant for exuberant read-aloud sessions. 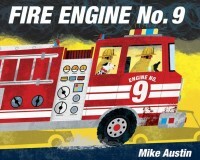 With art reminiscent of Donald Crews’s transportation books, Mike Austin evokes the excitement of a 911 call as we follow firefighters sliding down the fire pole, racing through town, and up the ladder truck. Includes fire safety tips from the Federal Emergency Management Agency.